As I mentioned in my last post, I usually do a lot of baking for Thanksgiving. I haven’t bought pies in years since I usually bake them myself. (Which is good because if you don’t get to Marie Callendar’s or Village Inn early enough, you can find yourself pie-less over the holidays. Horrors!) Since we were celebrated Thanksgiving over at my mom’s, I asked her what she felt like this year. 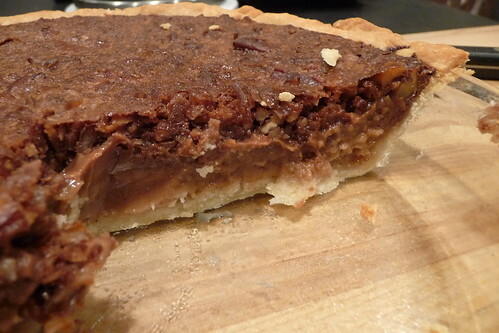 Which is how I came to make German Chocolate Pie for the first time. Now, I’m used to having this at restaurants (like the aforementioned two) and I remember it being this creamy, pale chocolate with chunks of pecan and coconut. I’ve never made such a pie before (not that I’d let that stop me) and started hunting around for a recipe. 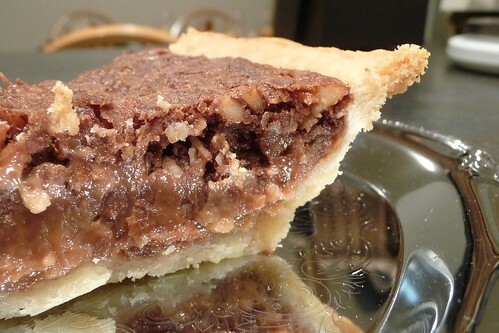 I quickly found that there seemed to be a “traditional” German Chocolate Pie since most of the recipes I came across were very similar, and finally chose one at MyRecipes.com. This is not the light, creamy, soft chocolate pie I was expecting. (Maybe I should have looked for a “silk” pie?) Instead, this is a dark, rich and extremely good pie. Because I altered the recipe slightly, I wound up with a bit too much filling, which I promptly poured into some mini pie shells I had lying around and baked in my toaster oven. One serving mini-pies are a fantastic thing and something I really need to do more often. German Chocolate here does not refer to Germany. Instead, it refers to a sweet chocolate commonly referred to as “German’s Chocolate” if you, like me, grew up with Baker’s brand chocolate. It’s one step up from semi-sweet on the sweetness scale. In American groceries, you can find it in the baking aisle of your local megamart (German Chocolate is the one in the green box). 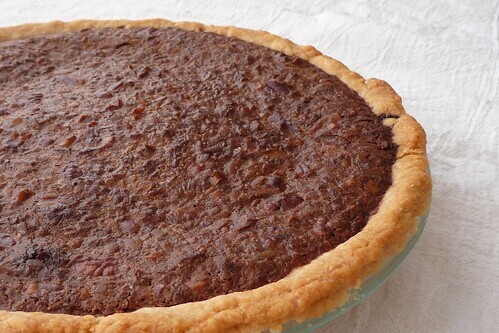 This pie, like pumpkin and pecan, does not require the shell to be blind-baked. I chose not to top it as my husband is sensitive to sweet and often prefers to top desserts like this with sour cream. I put whipped cream on mine. Delicious! Preheat oven to 375F. Prepare a pie pan and pie shell. Melt chocolate and butter together using your preferred method (see Note). Stir in evaporated milk and set aside. Mix together sugar, cornstarch and salt, then add eggs and vanilla. Whisk in chocolate, then stir in pecans and coconut. I love my microwave for this reason: It has a melt function. So, I melt chocolate and butter in it rather than fussing about with a pot on the stove or a double boiler or any of that nonsense. You should melt the chocolate and butter together however you prefer. As long as it all gets melted, it doesn’t matter. I baked my mini-pies (using a package of Keebler mini graham cracker pie crusts) in the toaster oven at 350F for 20 minutes. It was so very, very good. I think I’m going to make it again for Christmas, but I haven’t decided between a full size pie and mini pies.